At about 7 a.m. on the morning of April 25, I'll be standing among 35,000 people in downtown Nashville, as we prepare to race various distances as part of the St. Jude Country Music Marathon and Half-Marathon. It's an incredible sight to see all of those people lining the streets for miles, with seemingly no square foot of concrete left uncovered. As I look around I will also see hundreds of runners wearing a "St. Jude Hero" singlet just like mine, I'll know something that they won't know -- that the beautiful young lady standing next to me (and also wearing a St. Jude Hero singlet) might not be there if it weren't for their support. That beautiful young lady by my side will be my 10-year-old daughter Audrey. A little over three years ago she was diagnosed with an inflammatory myofibroblastic tumor (IMT) in her lung. In the early morning hours of her diagnosis, I asked the nurse how big the tumor was, needing some perspective on what she was dealing with. The nurse responded that it was approximately 10 cm. Having forgotten my metric chart during those difficult hours, I pressed her for a more relative comparison. She said that it was as big as a baseball. At the time, Audrey was only six years old and weighed only 38 pounds. The thought of a tumor that large in her tiny little body sent a wave of panic and concern over our family, not knowing what the future might bring. Fortunately, for children like Audrey, there is an incredible beacon of hope in the fight against pediatric cancer -- St. Jude Children Research Hospital. Audrey was referred to St Jude, where we quickly learned the depths to which this incredible hospital would go to ensure that she received the care she needed. In the three-and-a-half years since she has been a patient at St. Jude, she has received world-class care at no cost to our family. Her tumor has been eradicated through a series of surgeries and treatments that has left her completely healthy and able to lead the normal life of a 10-year-old girl. In fact, her health is so good, that on April 25 she'll be with me, competing in her third 5K as part of the St. Jude Country Music Marathon and Half-marathon. 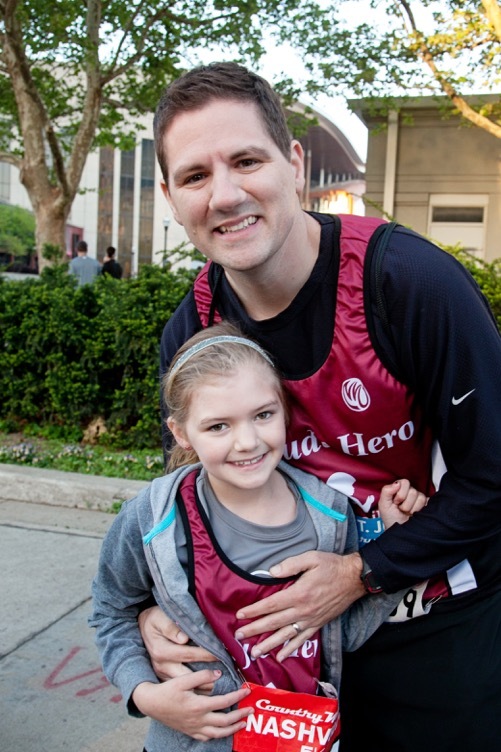 The St. Jude Hero program allows runners from all over the country to raise funds as they compete in races like the ones in Nashville. For my family, it has proven to be an exciting and fun way to give back to the incredible hospital that has done so much for us. For the last four years dozens of friends and family members have joined us to compete as Team "AC and the Tough Kids" in honor of my daughter (AC) and her fellow St. Jude patients, the ones she affectionately refers to as "the tough kids." As I write this we have raised nearly $225,000 for St. Jude over that time and are hoping to reach $250,000 by April 25. Our community in Sevier County, Tennessee, has rallied around us like I never could have imagined and has shared in our gratitude for all that St. Jude has done for us. St. Jude Children's Research Hospital subsists largely because of donations through programs like the St. Jude Hero program. It depends on donors to be able to provide the care children like Audrey so desperately need. As Audrey and I stand near the start line, I'll be thinking about those donors. I'll be thinking about my fellow St. Jude Heroes who have raised so much money and trained so hard. I'll be thinking about Audrey and how lucky we are to be there. Finally, I'll be thinking about the real St. Jude heroes -- the "tough kids" and the incredible hospital that cares for them.